According to the US Navy, which arrived on hand shortly after the intercept was made, the incident occurred on Friday, rather than Saturday. They also noted that the country responsible for boarding the Dhow was a member of the multinational Combined Maritime Forces (CMF). They did not specify which country made the interception. AP reports and USN statements included two more important claims. First, that the boat wasn’t registered to Iran, it was unflagged, and second, that it was headed to Somalia rather than Yemen. The lack of registry and other modern navigation aides is endemic in the Indian Ocean, where the swarms of similar craft give cover not just to piracy, but routine and exotic smuggling as well. Indeed, the inconspicuous dhow has long been considered a favourite of Iran’s Revolutionary Guards for smuggling operations in the Persian Gulf. These illicit networks go a long way in explaining the second claim. The weapons may have been headed to Somalia for local or secondary sale, but it’s also plausible that Somalia was only an intermediate stop. 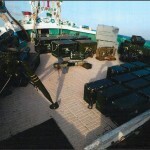 This would be consistent with past examples involving Iranian arms, which has seen illicit Iranian cargoes make their way through neutral ports to help disguise any tell-tale fingerprint among the clutter of maritime traffic (this tactic has not always worked, as seen in Israel’s 2009 seizure of the Francop). Alternatively, it remains possible that these arms were to be delivered directly to Yemen. The AP report raises important questions, including discrepancies with the initial al-Arabiya account. Nonetheless, it’s important to note that these questions are about how the incident transpired, not whether or not Iranian arms were interdicted in the first place. Indeed, after arriving at the scene, the US Navy published their own images, corroborating earlier conclusions based on al-Arabiya’s material. At least five TOW tripods can be counted, each one with the characteristic yellow bands described below. 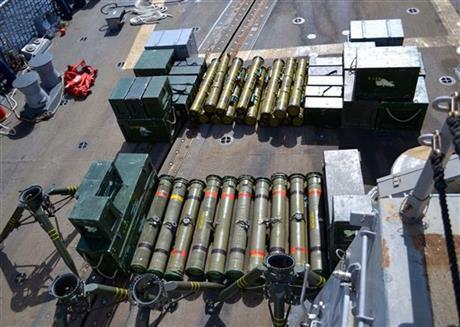 Ten TOW missile tubes are visible as well, and all but one of them carry the equally distinctive red colour code. 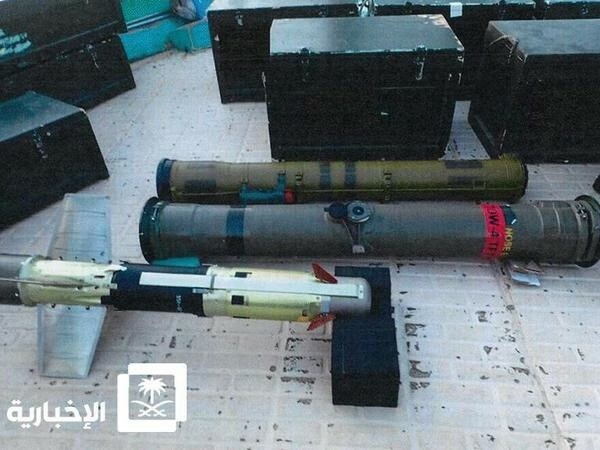 On September 30, the Saudi-affiliated al-Arabiya news reported that Saudi-led Coalition forces had intercepted an Iranian arms shipment en route to Yemen. 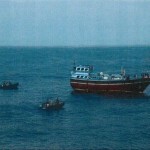 The incident took place on September 26, 150 miles off the coast of Salalah, an Omani city near the Yemen border. Preliminary reports gave no indication as to which coalition country made the intercept. The most likely candidates are gulf states such as Saudi Arabia or the United Arab Emirates. From released imagery the presence of both Konkurs and TOW ATGWs can be confirmed1. The remaining items are necessary components of these systems. There is some confusion in nomenclature that can be attributed to language and related conventions. For example, “fire control systems” may reference the TOW’s missile-guidance-system (MGS), at least one of which can be seen in the header image above. al-Arabiya lays the blame at Tehran’s feet based on the ship’s port of origin and its crew’s nationality. There is additional evidence from the imagery to support this claim. For example, the TOW tripod (seen above) is marked with three yellow bands on each leg. On American and other TOW systems these bands are typically painted over after they leave the factory, while the bands on Iranian TOW tripods remain yellow. 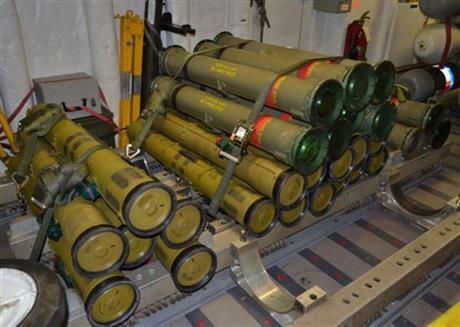 Additionally, some of the TOW missile tubes are marked with a red band (see below). 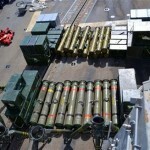 On American TOW missiles this band is yellow (indicating high explosive), or blue (practice). 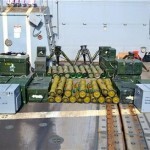 A mixture of red and yellow-banded TOW missiles are seen in some of the images. A US TOW would also feature a brown band towards the rear of the missile tube, indicating the presence of a low explosive (launch rocket motor). The band on this missile tube appears to be black, however this is difficult to ascertain from the low quality images available. 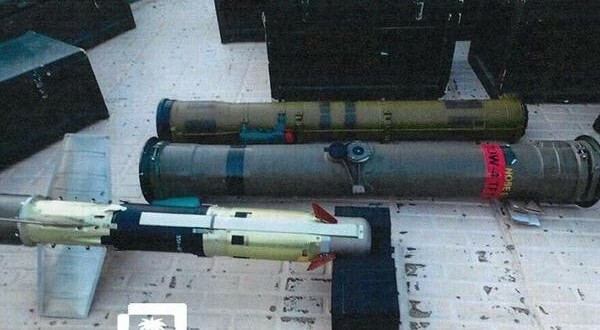 A TOW missile tube featuring a forward red band has only been observed once before, in the possession of the Iran-affiliated Badr Organization in Iraq. This unique colour code may correspond to an Iranian variant of the TOW, which is known locally as the Toophan. According to comments made in June 2014 by the senior official responsible for Toophan production, there are upwards of 11 variants. Only a handful of these are accounted for. The red band is marked with lettering that may read “TOW-4”, but the text is unclear and this interpretation cannot be confirmed. Iran’s support for the Houthi factions in Yemen’s ongoing civil war has long been alleged, in large part by Saudi Arabia, which backs pro-Hadi loyalists. However, there has been limited tangible evidence, especially when compared to Tehran’s more overt support in Iraq and Syria. 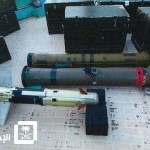 Outside of the Yemeni government’s January 2013 seizure of the Jihan-1, the most persuasive piece of evidence has been the limited use of a distinctive IRAM design since spring 2015, which had previously only characterised the Syrian and Iraqi battlefields. If confirmed, this seizure represents some of the most significant evidence of Iranian support. Moreover, it also indicates a willingness by Tehran to maintain a police of incremental escalation following the Coalition’s ground intervention over the summer. A single consignment of 70 guided missiles would provide a significant anti-armour capability in itself, especially when compared to the smaller numbers believed to be deployed on the Syrian battlefield at any given time. Further, the pattern of Iranian supply to actors across the region suggests that ATGW transfers are preceded by significantly larger quantities of mortar projectiles and rockets, as well as the provision of training and other assistance. This may suggest a far broader network of support than is currently being documented, or a noteworthy adjustment to Iranian operating procedures. The generic names “TOW” and “Konkurs” are employed here for clarity. Although the TOW is confidently assessed to be an Iranian Toophan, the origin of the Konkurs is less clear. Iran received a number of the missiles from Russia in the early-2000s, but since then they have also advertised their own copy under the name Tosan-1. However, recent export catalogs have consistently omitted this entry, casting doubts on their continued production. All photos sourced from al-Arabiya and Combined Maritime Forces.